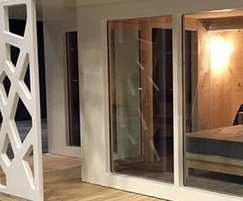 Metsä Wood’s laminated veneer lumber Kerto LVL is a state-of-the-art, lightweight engineered wood product that met every requirement Bernet had. 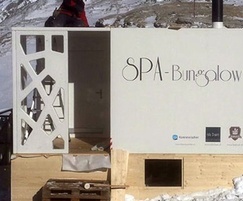 SPA-Bungalow consists of three wooden modules, all built exclusively from Kerto LVL Q-panels. Kerto LVL is a fast, light and green building material. It is dimensionally stable and does not warp or twist. Kerto LVL Q-panels are excellent for building stiff and high-quality floor, wall and roof structures. The builders used Kerto LVL Q-panels in two sizes: 69 x 6000 x 2500mm for exterior walls and the roof, and 39 x 6000 x 2500mm for inner walls. Elements built from Kerto LVL Q-panels were first mechanically bolted and glued together. The modules were then lifted by crane to enable covering all the exteriors with fiberglass-reinforced plastic. 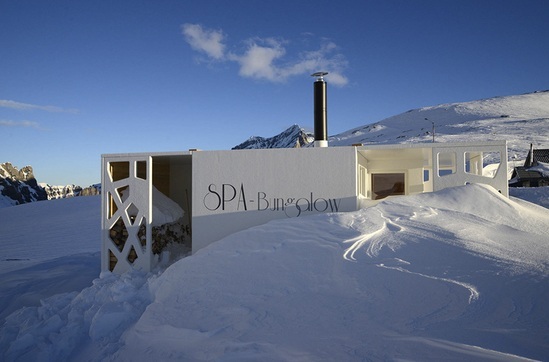 Once finished, SPA-Bungalow was completely weather-resistant and durable in extreme apline conditions. 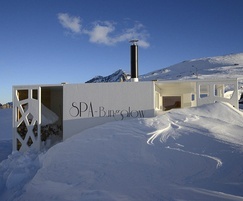 Construction of the first SPA-Bungalow took two workers approximately four weeks. Future versions can be produced in less than half this time.